Aug 28th harvest: The basket is full of Cherokee Purple tomatoes, this plant has by far been the best producer this year. Next season I am growing at least three Cherokee Purple plants. The tomatoes on the raised bed from left to right are two Purple Calabash (from Skippy's Vegetable Garden), one Hillbilly Potato Loaf (this tom is minuscule compared to the monsters currently on the plant) and three Velvet Red (from The Conservative Gardener). In front is a zucchini that was grated and froze for baking, a few cherry tomatoes and a couple cucumbers. These two will probably be the last cucumbers of the season as the leaves have been devastated with mildew. Aug 30th harvest: In the basket are the last of the early red potatoes that I grew in compost bags. They have done pretty well but the yield was low. Also in the basket is a mix of beans, Kentucky Blue, Purple Podded & Dragon Tongue beans. Beans really have been a bust this year, the Dragon Tongues produced well for a couple weeks but the poles have barely produced at all. Last but not least the tomatoes! The pinkish one is Giant Belgian (sweet, non-acidic taste), the yellow is Porkchop (extremely yellow with a nice acidic tomato taste) and two Cherokee Purples in the back (the best tomato in my opinion). There also is a couple black cherry tomatoes tucked in there. *Update - I went out to see if I could find any more damage and there is brown spots on the leaves and stems. I removed some more material and I guess I will just have to wait it out. I hope that at least the largest tomatoes that currently are on the plants will ripen. I am definitely not going to spray, the organic copper based sprays can kill birds & worms as well as cause liver damage to humans so I will not touch that stuff. I guess this is to be expected with the season we have had. July saw only three days above 30c(86F) and August was not much better. August was also very rainy with use seeing a 1/4 more rain then the norm. This season has really tested ones veggie gardening patiences! 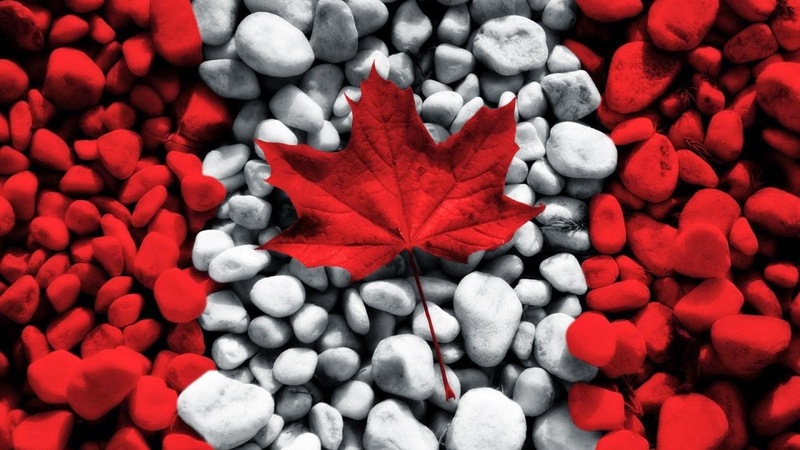 It's a blustery cool day today, very reminiscent of the fall. Looks like weather in the low 20's(68f) is here to stay for a while so what better of a topic then fall crops. Since Aug 15th I have seeded quite a few things, both in cell packs and directly in the soil and they are all up now. All the fall crops that I started in July are doing well also. Vates Kale, growing in the cold frame. Spinach, growing in the cold frame. Mache, growing in the cold frame. they will produce because of this. into the poly tunnel to extend their harvest. with mache which tolerates shade and can be harvested after the celery is harvested. Merlot Lettuce, it will be growing out in the open. Easter Egg Radish, these also will be growing out in the open. This fall I am growing Easter Egg, Black Long & China Rose Radishes. Some will be grown in the open well some will be grown with protection. weather comes for a few days. early on and these certainly have! In no particular order, here we have little gem romaine, merlot lettuce, napa cabbage, bright lights chard (from Daphne's Dandelions ), sugar loaf chicory & batavian full heart. These were all started around the first of Aug and will be planted into the poly tunnel this weekend. & I think Australian Yellowleaf lettuce. kind of sickly looking but are putting out a couple cukes, maybe they will pick up soon. and I am hoping for a couple pickings before the October frosts. 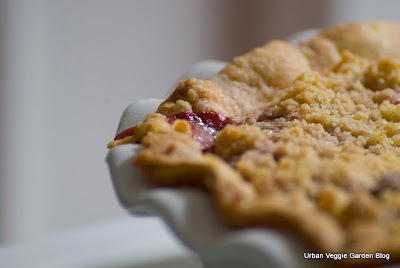 After having many comments about the rhubarb on my last harvest post I thought I would start this garden meals post with the pie I made with the rhubarb. 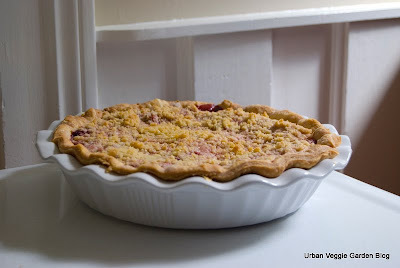 I made the same pie that I made this past strawberry season which is a Strawberry-Rhubarb Pie w/ Ginger Strussel topping. It is an excellent recipe with the end result being a jammy, spicy, sweet pie, yum. The recipe can be found on my Mom's baking blog. This did not translate well in photo form but here we have Dan's Torn Tomato Salad and a Grilled Ham & Cheese Sandwich. Here we have Zesty Fingerling Potato Salad w/ Herbs, Green Beans w/ Caramelized Shallots and Schnitzel. In a bowl whisk together all the dressing ingredients until emulsified and set aside. Boil potatoes until tender, about 10 minutes. Drain and then cut in half. Add prepped potatoes into the dressing, toss and allow to cool in the fridge. Once cooled add the sour cream & herbs and toss again. Taste and adjust seasoning before serving. Boil beans until 3/4 cooked, drain and set aside. In a pan add olive oil & shallots and cook until they caramelize. At this point add the beans to the pan and cook until the beans are cooked through. Season with salt & pepper before serving. Harvests this past week seemed to be a little slow until today. It would appear that the mildew has completely shut down cucumber production and there still is a lot of green tomatoes out there. Good points are the pole beans have provided their first harvest and the fall crops are well on their way. Here goes the harvest photos from the last seven days and like always if you would like to join in you can post your link on Daphne's Dandelions so everyone can check it out. Aug 18th harvest: 'Valentine' Rhubarb. I plant two crowns of this plant this spring and they have do extremely well. So well in fact I am not worried about harvesting a few stems in the first season because the plants are so thick. They currently are in the crisper but will soon be made into a strawberry rhubarb pie. Aug 20th harvest: In the top photo, starting from left to right we have two cherokee purples tomatoes, one Purple Calabash tomato (seed from Skippy's Vegetable Garden) and one Siletz tomato. In the second photo are four cucumbers, an assortment of black cherry and black zebra tomatoes and a Jimmy Nardello pepper (not sure if I really like these peppers). Aug 24th harvest: Starting with the top basket photo there is the first green beans of the season and a few 'Dragon Tongue' beans which production has really slowed. For tomatoes there is a cherokee purple, two jersey devils and an assortment of black cherry & black zebra that are hiding. Then a few early red potatoes and what I think will probably be the last cucumber from the garden for a while. The lower photo shows half a row of 'Chioggia' beets that I harvested today. Beside the beets are all the seed grown 'Prince' onions that I harvest today as well. Half the onions are your average cooking onion size and the other half are rather small. Seems I didn't get my massive onions again this year! Last but not least is a large 'Cocozelle' zucchini that will be grated and froze for later baking use. Aug 17th side dish: I think greek inspired salads are the best, certainly puts a poky lettuce salad to shame. To prepare cut cucumber and tomatoes into chunks, red onion is also a nice addition. Then top with halved kalamata olives, cubed feta and dress with an oil/vinegar vinaigrette. I have both a propane grill and a weber charcoal kettle. I must say the kettle is the best in terms of fun and flavor. What's better then starting a fire and cooking over red hot coals right! Grilled tomatoes. It is best to use a tomato that has just turned color but is still firm. Cut the core out and cut the tomato through the center. Drizzle olive oil on the cut surface and salt. Place cut side down and grill until caramelized and softened. Remove the skin before plating. Grilled rib steak, just so happens to be my favorite steak! I like my steak kept simple. Before grilling I bring the steaks to room temperature and then apply salt just before grilling. I turn the meat once and grill until they reach medium doneness, rest meat until the juice is reabsorbed and serve. Yum! The last thing grilled on this particular day was halloumi cheese. If you have not tried halloumi before it is a salty greek cheese that is firm and doesn't melt easily so it can be grilled. It is like cheesy grilled heaven! Definitely worth sourcing. To grill I slice it 1/4" thick, drizzle with olive oil and place on a screaming hot grill. Grill for a couple minutes, turning once. Aug 20th dinner: Today's dinner was veggie bulgar salad (recipe here), steamed romanesco broccoli (excellent and sweet) and pan caramelized Italian sausage. Is it just me or does it look like that cucumber spear is moving? After receiving actual summer heat last week all the crops have shown a drastic improvement in growth. Melons are setting, squash are ballooning and the tomatoes are actually starting to turn color. The pole beans have even started to produce! The rest of this week is forcasted to be cooler however but it looks like from here on out we will be basically having seasonal weather, finally. Here is a shot from the patio which was taken well drinking morning coffee. As you can see the beds are laid out in a way that the hedges low sun shade line is almost at the end of each bed. Here are the lowest beds. 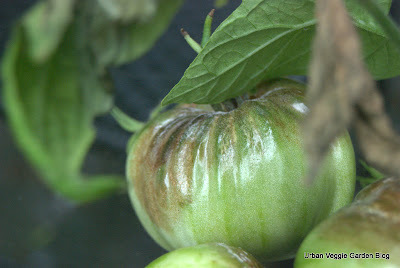 You may notice the cucumbers I was just blogging about with the yellowing/mildewed leaves. I have also put the uncovered cold frame out and seeded it with kale, spinach & mache for fall harvest. In behind the frame is broccoli & brussels sprouts also for fall harvest. Here we have the pepper bed that is coming along nicely. The pot garden in front with radicchio, sport peppers(doing nothing) and the late planted sungold in the middle. I have also put the uncovered poly tunnel out and so far have planted celery starts and mache. The rest will be planted out with the started I currently have growing in cell packs. In behind the poly tunnel is vermont cranberry beans & red beets. Here is another bed in the middle of the garden. It has fall parsnips by the poly tunnel, eggplant in the front and seven tomatoes that have recently been pruned. Above are the topsy's that are growing like crap and fall veggies growing in the cell packs on the window sill. Now we are into the top raised beds. This shot shows three more tomato plants, pole beans, dragon tongue beans, zucchini & carrots that are squeezed in the middle, poor carrots. Finally the very top bed. It has melons on the trellis, trenched leeks in the front and bright lights chard (seed from Daphne's Dandelions). Then at the very top is the potato bin that should be ready for harvest some time in September. Hillbilly Potato Loaf Tomato, this monster is 15" around! I am guessing it will be just under 2lbs once it ripens. I may need a bib to eat this one. Red Kuri Square, this one has really grown fast and is 19" around so far. I'm not sure how big these get but I think I need to support it soon. Delicata Squash, there are two that are 9" long and one that is 6" long. The seed for this squash was shared by Skippy's Vegetable Garden. Charentais melon, it has tripled in size from the last time I blogged about it, still small though. I hope this is the melon that could. Sungold Tomato, I started this plant late, seeded around the middle of June I believe. It has just started to produce and I can't wait to try these famous sungolds. It is growing in a container so I am hoping to keep it going late into the season by moving it into the shed during cold days and nights in Sept/Oct. 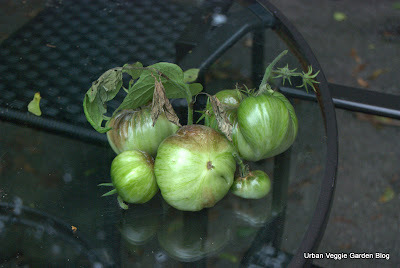 Purple Calabash Tomato, it produces cute little ruffly tomatoes that are purple. This one will be ready any day now and I can't wait to taste it for the first time. The seed for this was also shared by Skippy's Vegetable Garden. Lemon Queen Sunflower, although it may look large it is only a few inches across. This grew from seed the Great Sunflower Project sent to me and now that a flower has opened I can start submitting my bee counts to them. Here goes this Monday's Harvest post. If you would like to join in you can post your link on Daphne's Dandelions for all to see. First of all I will update on the garden. The past week or so it has actually been hot which has been a drastic change from what most of the summer has been. Today the high was 30c(86f) and with the humidix factored it was 38c(100f). I hope this weather sticks for the remainder of summer because all the warms season crops have shown a drastic improvement in growth. In fact I think update photo's will be in order at some point this week. Now onto the harvests. They have been very similar to last weeks harvests with a few tomatoes, beans, zucchini and lots of cucumbers. For the most part the harvests have been just enough to consumes quickly which has been nice. With that said I think in the next week or two I will be in a glut of tomatoes & beans which will need preserving. Aug 13th harvest: Here are a bunch of small storage onions as you can tell in reference to the pickling cucumbers. They will be used whole in stews this winter. We also have cucumbers and a zucchini. Believe it or not my zuc really is not producing much. I hope with the heat it starts because I wanted to make a half batch of zucchini relish this year. August 15th harvest: Above is more cucumbers, they have really done well this year. 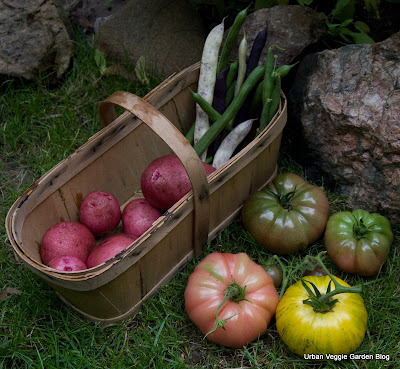 Also in the basket is a few cherry tomatoes, a chocolate stripe tomato & a siletz tomato. In the next photo is a full basket of dill heads that I used for the 7 litres of baby dill pickles I made Friday night. I made them extra dilly as you can see and a post about them to come soon. August 16th harvest: I noted a few post ago that the red fingerlings had started to die back so I have since harvested them. From the 24" contained they were growing in I harvested 1lb 11oz of fingerlings which doesn't seem to shabby to me. The funny things about them is I planted red fingerling potatoes and ended up with mostly yellow fingerlings with a little bit of rose here and there. I also harvested the last romanesco broccoli head and it was about half the size of the first one. They seem to turn an off color when they mature in the heat. I think next year I will plant early for harvest in June. August 17th harvest: Today I harvested the last of the set grown onions. They die back much faster then the seed grown ones and I find they mature much smaller. I also picked a siletz tomato and a few cherry tomatoes including the first velvet red tomato from The Conservative Gardener. Then I harvested another litre of dragon tongue beans which seems to be a Monday ritual lately. Well in the garden today I noticed that quite a few charentais melons are setting, I am really hoping for at least a couple ripe one this season. The squash are also really ballooning in this heat and the pole beans will be ready by next week, finally! Lots of tomatoes are starting to faintly show signs of color! Bad news is today was the first time I did a harvest without any cucumbers. The vines have alot of mildew & yellow spots so I don't think they will be around long. There is how ever about 6-8 small cukes on the vine which I think may be the last of them .